Ian Ritchie is the director of Ian Ritchie Architects Ltd (established in 1981) and co-founded Rice Francis Ritchie (RFR) design engineers, Paris (1981). Ian Ritchie Architects has “sister” practices in Europe. 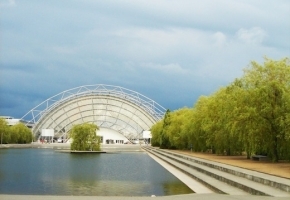 These practices have realized and contributed to major new architectural and engineering works throughout Europe, including the Reina Sofía Museum of Modern Art in Madrid, the Leipzig Messe Glass Hall, the Louvre Sculpture Courts and Pyramid, La Villette Cité des Sciences, the Jubilee Line Extension and International Regatta Centre in London, The Spire in Dublin, and the Royal Shakespeare Company Courtyard Theatre. Current projects include th Sainsbury Wellcome Centre for Neural Circuits and Behaviour at University College London (completion in 2014); Royal Academy of Music’s new opera theater in London; transformation of the Tricycle Theatre, Kilburn and reconfiguring the Royal Shakespeare Company Courtyard Theatre; residential-led mixed developments in Covent Garden and Bromley; and a new business park and visitor center in Malta. Ritchie has acted as design master planner for the Natural History Museum and The British Museum, and for city center sites in London, Birmingham, Copenhagen, Dublin, Glasgow, and Edinburgh, as well as conceiving and designing international exhibitions for major European galleries. He currently advises the Royal Shakespeare Company (design); The Ove Arup Foundation (education); the European Construction Technology Platform (research agenda); the Director of the Centre for Urban Science and Progress New York University; the Dean, School of Architecture, Design and Construction, University of Greenwich; the President, Columbia University, Manhattanville Project; and Backstage Trust. Ian Ritchie is a Royal Academician, member of the Akademie der Künste, Honorary Visiting Professor at Liverpool University, and Emeritus Commissioner Commission for Architecture and the Built Environment (CABE). He has been Royal Academy of Arts’ Professor of Architecture and Chair of its Collections and Library Committee, Visiting Professor of Architecture at Moscow and Vienna Universities, Special Professor at Leeds University faculty of Engineering, and taught at the Architectural Association (AA) and University of Westminster in London. He is a Fellow of the Society of Façade Engineering. He is invited regularly to international juries and has chaired several, including the French government’s Nouveaux Jeunes Albums (2004), RIBA Stirling Prize (2006), and Doolan Awards Scotland (2009). His practice has received more than 60 national and international awards for his projects and has been shortlisted four times for the RIBA Stirling Prize and the European Mies Van der Rohe Prize. 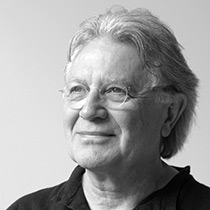 Ritchie has personally been honored with a CBE, the French Académie d’Architecture Grand Silver Medal for Innovation (the first foreign architect, joining a small and illustrious list including Candela, Nervi, Buckminster Fuller, Prouvé and Rice); the Iritecna Design Prize for Europe; the Eric Lyons Memorial Award for European Housing; and the Commonwealth Association of Architects Award for the Advancement of Architecture. He lectures regularly on art, urbanism, regeneration, light, structures, glass technology, and innovation, delivering talks at prestigious venues including the Royal Academy of Arts, Tate Gallery, Royal Society of Arts, RIBA, ICA, Hayward Gallery, Pompidou Centre, European Commission, New York’s Center for Architecture, and on behalf of the British Council, CABE, the UK Lord Chancellor, and the British Science Association. His practice has a reputation for delivering designs that are consistently cutting-edge (and unexpected) in terms of techniques and materials, inventiveness, imaginatively conceived details, and an integration of architecture, engineering, and fabrication. In addition, the practice has undertaken research and development for major international companies including Corus, Pilkington, Mero, and Seele. His firm’s architecture is regularly published in journals and books worldwide, including Ian Ritchie: Technoecology by Alessandro Rocca (Whitney Library of Design, 1998). 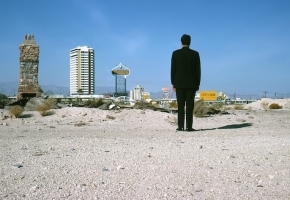 Books by Ritchie include (Well) Connected Architecture (1994), The Biggest Glass Palace in the World (1997), Plymouth Theatre Royal Production Centre, (2003), The Spire (2004), The RSC Courtyard Theatre (2006), The Leipzig Book of Drawings (2007), Lines, an illustrated book of poetry (2010), and Being: An Architect (2014).